Medical malpractice lawsuits often involve a doctor’s misdiagnosis or failure to diagnose a patient’s medical condition. A missed diagnosis or failed diagnosis can be the result of a variety of actions by the doctor, such as: not spending enough time with the patient to develop a full medical history or failing to pay enough attention to the patient’s complaints or symptoms, or improperly reading a test or lab result. The doctor’s negligence must have caused injury to the patient, separate and apart from the condition that should have been diagnosed. As a patient, you believe that your health care team will conduct the necessary tests, be vigilant about your symptoms, and correctly diagnose your medical condition. When your doctor fails to correctly diagnose or treat your condition it could potentially be a life-and-death matter. One way to help recover financial losses caused a misdiagnosis is to file a lawsuit. The fact that a misdiagnosis happened does not prove negligence. Even the most skilled doctors can make a diagnostic error. The key to determining whether the doctor acted in a reasonable and competent manner is examining the way in which he or she arrived at the diagnosis. This process is called the “differential diagnosis” and is the method in a doctor will use in making treatment decisions. Differential diagnosis begins with a preliminary evaluation of the patient. From this evaluation, the doctor makes a list of potential diagnoses in the order of probability. The doctor then makes further observations of the patient, asking more detailed questions about medical history and symptoms, ordering tests, and if needed refers the patient to specialists. During the investigation process, the doctor may discover additional information that could point to another diagnosis, which is added to the list. Each potential diagnosis is then tested for the probability and the doctor eliminates any that are ruled out in the process. Ideally, only one diagnosis will remain at the end of this process. This process is not infallible and can sometimes result in an error. 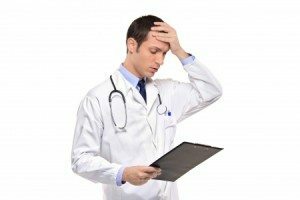 Did the Misdiagnosis Cause Harm to the Patient? The patient must also prove the doctor’s misdiagnosis or delayed diagnosis caused the injury or condition to progress, beyond where it normally would be if there was a timely diagnosis, and that the delay had a negative impact on treatment. For example, if a doctor fails to diagnose a patient with cancer, the patient could have to undergo a more aggressive form of chemotherapy, or in some cases the cancer may progress so far by the time that the correct diagnosis is made, that treatment is no longer an option and the misdiagnosis causes death. Even if the condition is treatable, a delay in treatment could increase the risk of recurrence. If a patient is diagnosed with a condition or illness that he or she does not have, the patient can still prove damages such as stress, anxiety, expenses due to unnecessary treatment, and medical problems from the unnecessary treatment. If you or a loved one has suffered injuries or harm from a misdiagnosis we can help. Our attorneys are experienced with all types of medical malpractice cases and will fight to get you the justice you deserve. We pride ourselves on putting our clients first. Call us today for a free consultation. All calls are kept confidential.